Wednesdays, Fridays, Sundays at 7:30 p.m. 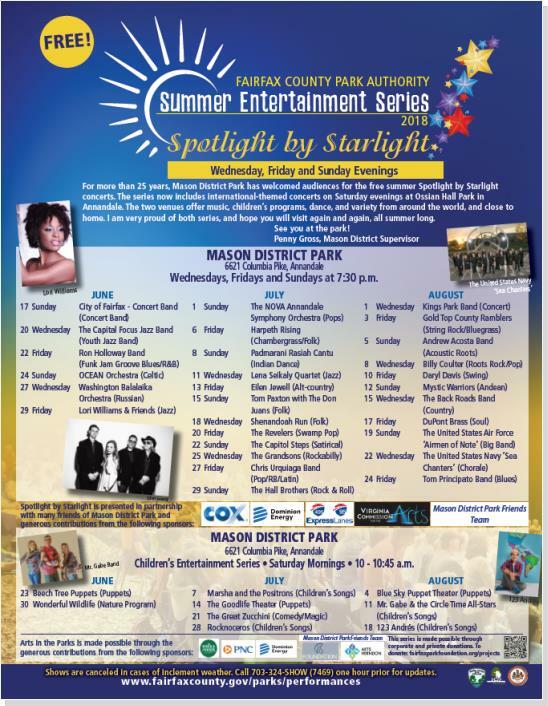 Spotlight by Starlight is a free summer concert series presented by the Fairfax County Park Authority at Mason District Park. All performances are on Wednesday, Friday, and Sunday beginning at 7:30 PM. Performances for children are held on Saturdays beginning at 10 AM. 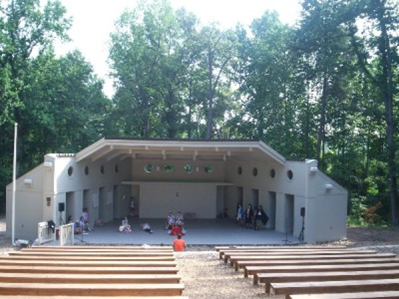 A full schedule of children programs will be available after May 1st at www.fairfaxcounty.gov/parks/performances. In the event of inclement weather, call 703-324-SHOW after 6 p.m. for performance cancellation updates. Saturday Evenings • 7:30 -8:30p.m. 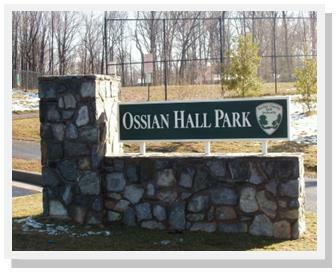 Running through August 19th, The Summer Concert Series at Ossian Hall Park takes place at 7:30 pm on Saturdays. 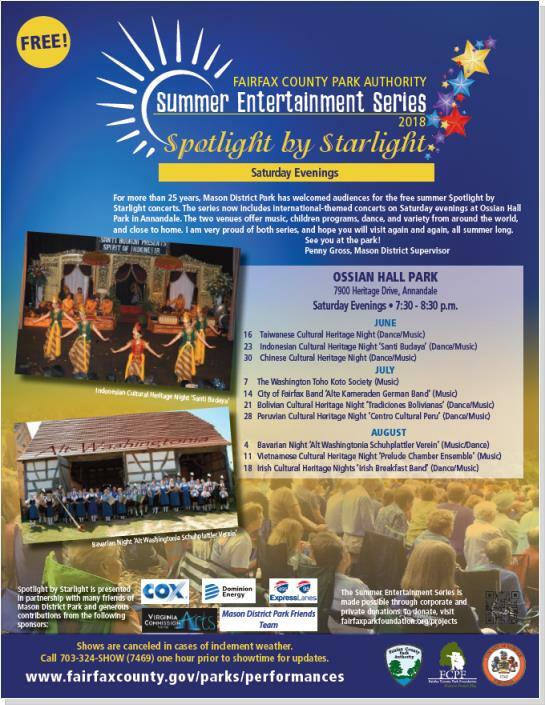 Located between Heritage Drive and Annandale High School, you will be able to enjoy FREE live music while celebrate the community’s cultural diversity with dance and music from at least eight different nations. Each group will be wearing lavish native costumes, make-up, and styling. Bring friends, food and the family and be ready for a fun, relaxing evening. Lawn seating is available in abundance or bring your own chair. The Fairfax County Park Authority will host free summer concerts in the backyard of the Fairfax County Government Center every Thursday night this July and August (July 5 – August 30, 2018) from 5:30pm – 7pm. The Evenings on the Ellipse summer concert series is a family-friendly event featuring a talented line-up of performers and a wide range of musical genres. Fairfax County’s two wineries, Paradise Springs Winery and The Winery at Bull Run, will be providing generous tastings and sales of their premium reds and whites. A Farmers Market (open from 2:30pm – 6:30pm) will also be on site selling fresh fruit and savory snacks to enjoy at the concert. The concert and farmers market are both held rain or shine. If it rains, the concert will be moved inside to the Fairfax County Government Center Forum. Evenings on the Ellipse is one of many concert series happening throughout Fairfax County this summer. Find more concerts and performances at fairfaxcounty.gov/parks/performances.